Thanks to the misconception that former Eastern European countries are still staunchly conservative, Poland might not be the first place that comes to mind when you think of tattoos. But as home to both the region’s first tattoo museum (that would be Muzeum Tatuazu in Gliwice), and a tattoo expo in every major city, they’re catching up quickly. Polish tattoo artists often tend to lean in heavily to a singular style, with many of them drawing from the visual traditions of their country (think bold colors, strong graphic designs, and storybook-style imagery). So, no matter what city you stop at, you’re more than likely to find a unique tattoo shop ready to custom design you a souvenir tat at a fair price. Here’s a few of our favorite cities and artists to get you started. Warsaw-based Tuz za Rogiem specializes in black work tattoos full of fine lines and intricate dot work. Not ready to commit to his surreal takes on nature, animals and geometric shapes? The artist also has several paper-based offerings for sale. Another capital city artist wielding the tattoo gun is Marcin Aleksander Surowiec. His attention-grabbing designs borrow from soviet-style poster art with a modern body-art friendly twist. Expect a lot of red, black and straight up awesome. Chest pieces and sleeves would look particularly impressive in his bold style. Artem Sherstobito works out of Poznan’s HYDRA studio. His work is full of surprising details. Although he primarily works in black lines and strong graphic images, he’s got a flair for single-line images; dot work; and surrealist imagery, large-scale chest pieces, and micro imagery. Krakow-based artist Magda Trojanowska has a habit of elevating traditional tat subjects (mermaids, anchors and flowers) to the next level with her dazzling, watercolor-style designs. Bring her your most whimsical ideas and she’ll add a splash of color. Lodz may be Poland’s third biggest city, but if your aim is for a photo realistic tattoo portrait, Bartosz Bartecki is your No. 1 man. His multidimensional takes on your family members, beloved pets or the Joker (because why not?) pop with color and detail. Meeting him could be the beginning of a beautiful friendship … or just a badass half-sleeve. Poland’s favorite vacation spot, the tri-city trifecta of Gdansk, Gdynia and Sopot hosts a lot of great tat talent in addition to seemingly endless kilometers of seaside. But if your goal is to get a magical illustrative tattoo, head to Julia Dosiak (pictured at top) who works out of Zajawa Tattoo in Gdansk. 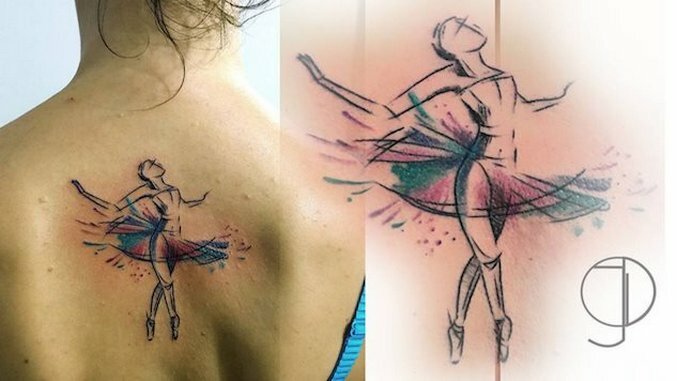 Her work is a bewitching blend of minimalism and splashy watercolor, which means not matter what the concept, you’re sure to get ink that’s truly one of a kind. Bianka Szlachta is a member of Ink Miners Collective —a bit of a joke since Katowice is a known for its coal mining. Her black line animal and human characters have a darkly comedic edge to them, rendered to look like they’re caught in the act of contemplating nothing less than life, the universe and everything. Laura Studarus is might actually be addicted to jetlag. Follow her adventures on Twitter.